For Freshwater and Saltwater aquariums. Distributed by Aquarium Pharmaceuticals inc.
Copper, a common treatment for many parasitic infections, must be monitored carefully in a aquarium or pond. The copper level can drop too low for the treatment to be effective, or can increase to a point that is detrimental to fish health. Copper may even be present in your tap water. 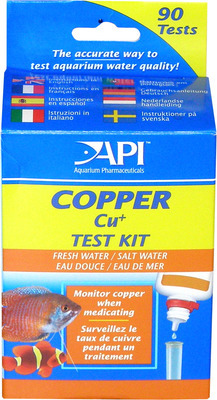 This kit allows you to easily and accurately measure the copper level and maintain a healthy aquarium for your fish. This kit contains: Dropper bottle for accurate dispensing of test solution. Easy-to-read instructions and colour chart. Non-staining-glass test tube with snap-tight cap.